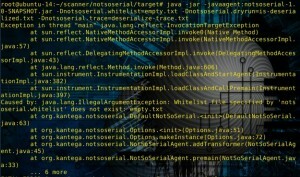 Browse: Home / NotSoSerial is a Java Agent designed as a mitigation effort against deserialization attacks. 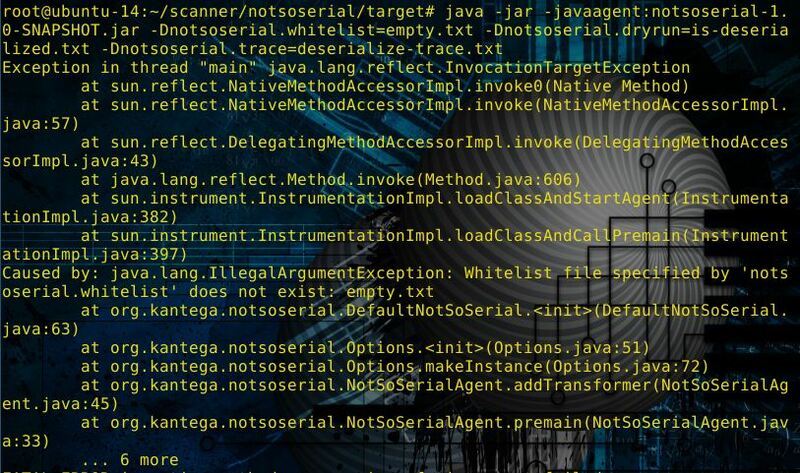 NotSoSerial is a Java Agent designed as a mitigation effort against deserialization attacks. Think of it as a “deserialization firewall”. It gives you complete control over which classes your application should be allowed to deserialize. – src folder :Moved configuration into a new class Options. – pom.xml: Instrument ObjectInputStream.resolveClass instead of injecting / modifying readObject for each class. PLEASE NOTE: In this mode, NotSoSerial only does blocks a few known vulnerabilities. It does not fix the problem with deserialization attacks. 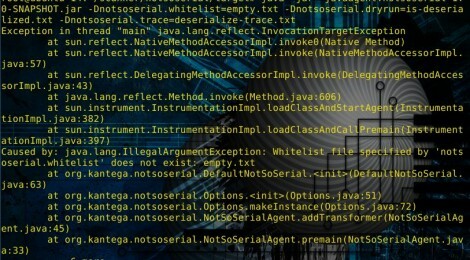 It only knowns about some well known classes for which it rejects deserialization. See below how you can whitelist or completely reject any objects to be deserialized. As always, it would be better if we could accept only classes we explicitly want to allow for deserialization. Rejecting based on a whitelist is better security than rejecting based on a blacklist. To help build a whitelist file with legitimately serializable classes, a ‘dryrun’ option has been added. Together with an empty white list, this will create a list of classes which your application actually deserializes. Where ’empty.txt’ is an empty file and ‘is-deserialized.txt’ is a file where the names of your actually deserialized classes will be written to. Just use an empty whitelist. Preliminary testing with a non-trivial Java application (which does not intentionally use RMI or other serialization) seems to indicate that this might work just fine. Looks like the JDK might not need serialization for any of its internal operations. You might be interested not just in which classes your application deserialize, but also where in your code deserialization happens. ← pycket is A simple python packet sniffer and manipulation tool.